William F. Helmcke, a longtime Oceanside resident and former principal of Oceanside Junior High School, died in his home in Sedona, Ariz., on March 12. He was 95. Helmcke was born on March 9, 1917, in Oceanside, the son of Margaret and Charles Helmcke. He lived there his entire life, and graduated from Oceanside High School. In 1938, he graduated from New York University, having earned a football scholarship and studied physical education. At 6 feet tall and 225 pounds, Helmcke was an imposing figure on the football field in a time before modern padding. In 1942 he enlisted in the Merchant Marine Corps. He had hoped to join the Navy, but was rejected because of a knee injury from his football days at NYU. His brother, Charles, represented the family in the Marines. The war years were the first significant amount of time that Helmcke spent away from Oceanside. Luckily, he was with his wife and high school sweetheart, the former Evelyn Becker, of Rockville Centre. The two met at Holy Trinity Lutheran Church in Rockville Centre and were married in 1939, and Evelyn joined William when he was stationed at a training base in St. Petersburg, Fla. In 1945, the Helmckes’ first daughter, Carol, was born there. Their second daughter, Barbara, arrived a year later. In 1946, the family returned to Oceanside, and Helmcke began a career in the school district as a phys. ed. teacher in School 9. During his years there he was also the high school football coach. He taught phys. ed. 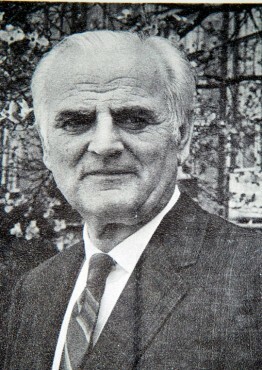 until about 1952, when he was promoted to vice principal of Oceanside Middle School, a position he held for five years before being named principal. At the time, the district was changing dramatically. Unprecedented population growth in the 1950s and ’60s spurred the construction of more schools. Marshland in the southern part of Oceanside was filled in, increasing the livable area of the community. There was a huge increase in home construction, and with it came new students, turning the junior high school into the busiest junior high in the region. New school buildings were constructed, and a new wing was added to the junior high, which is now the School 6 Kindergarten Center. Helmcke was an active member of the Kiwanis Club, a Little League coach and a volunteer firefighter, as well as a devoted family man. Every year he took his family on cross-country camping trips, and they remain some of his daughter Carol Alling’s favorite memories. In 1972, at age 55, Helmcke suffered a heart attack. He decided then to retire from his stressful job as the principal of Oceanside Junior High, and he and Evelyn bought some land in Sedona. The family had been to the area on a camping trip in 1958, and it occupied a special place in their hearts. The Helmckes built a home there and moved there for good in 1974. In their later years, the couple moved to a local assisted-living facility. He and Evelyn carried their love of the outdoors into their golden years. They became avid hikers, hiking the Grand Canyon twice. They also traveled the world, visiting Portugal, Alaska, Malaysia, Africa, Australia, England, New Zealand and Norway, among other destination. Evelyn died in 2007. She recalled how her father would make sure his daughters understood how the world worked, and that they always considered other people’s opinions. “Around the supper table at night, he would occasionally play devil’s advocate,” said Alling. “We’d talk and everybody got their say, and you could disagree and nobody made fun of other people’s opinions. And Dad would make sure that other points of view were presented, even if they weren’t his own. “He made us think,” she added. © 2012 Richner Communications, Inc.